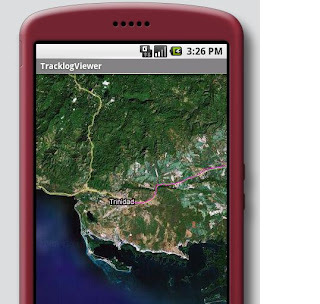 How difficult is it to turn an Android Phone into a fully fledged GPS unit? Starting from scratch, this blog illustrates Android programming for a medium-complex real-world example. Now that we have a simple MapView centered on the start of the track it comes to displaying the tracklog. The second approach is just to subclass Overlay and override the draw method, painting onto the canvas. tracklogs can be very long and it might for performance reason not be advisable to display all of them. tracklogs can contain points off the map, which need not (and should not) be displayed. if we select only those points on the map, we want to draw lines between adjacent points, but not between segments. we will want to colour trackpoints, name them etc, but we do not tackle this issue at this point. // select only points in currently displayed window. // TODO: this has the problem that we cut off the trail at the edges of the image. actually what we want is all points on the screen plus those that precede and follow them so the tracklog will be drawn to the edge of the screen. This could almost be done by selecting a slightly larger window for the selection, but there is no guarantee that the first outlying points will be in. This is yet to be resolved. what we get are potentially track-segments where the track meanders on and off the screen. To test for this the code relies on the autonumbering of IDs in the DB: where there is a gap between painted points, there is a gap in the track and we do not draw a line. depending on the zoomLevel, a lot of different geographical points (GeoPoints) will fall onto the same point on the screen and drawing a line from a to a is pointless and expensive. With the moreThanMinimumDistance I compute a simple pixel Pythagoras and exclude those points that are below a certain distance. This will be a bit inaccurate, but difficult to see on the real unit. I arbitrarily limit the number of points drawn to some X. This will at one point become a configuration issue, settable for preference and processing power of the unit.